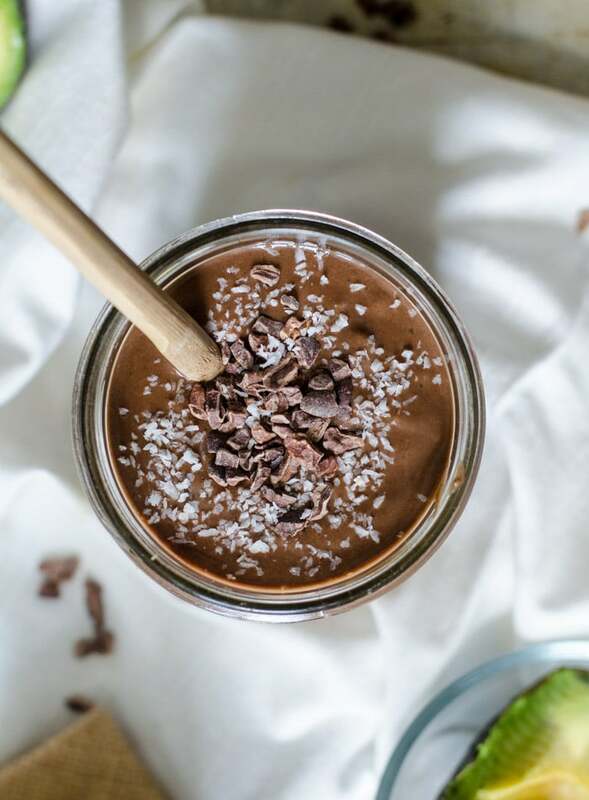 This Chocolate Avocado Banana Smoothie is right up there with the rest of my favourite smoothies on the blog. It’s extra thick and creamy, perfectly sweet, packed with flavour and highly nutritious. Whether or not you love avocado, you’ll love the smooth, creamy texture it adds to this smoothie. 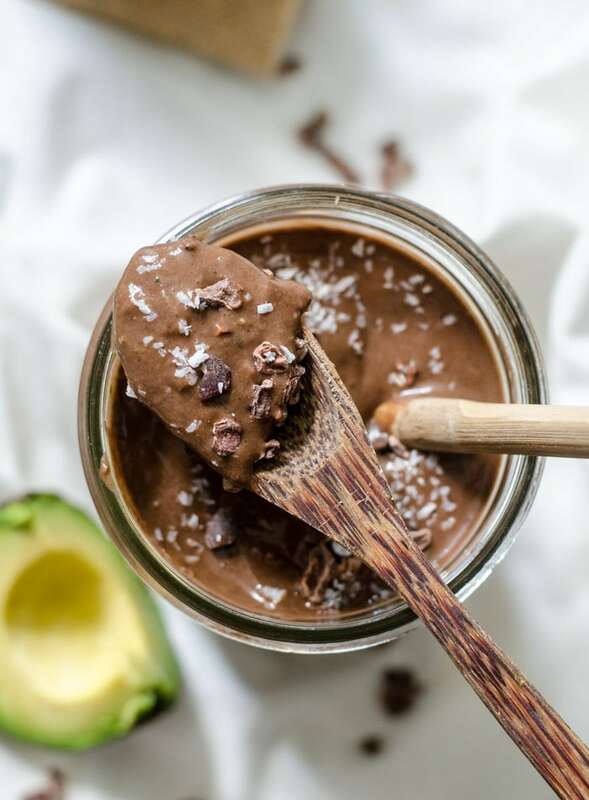 This recipe also features healthy, whole food ingredients like frozen cauliflower for added nutrition and volume, frozen banana for the perfect natural sweetness, raw cacao for it’s powerful antioxidant benefits and almond butter for healthy fats, flavour and creaminess. Avocado is an ideal source of healthy fats, fibre and antioxidants and I love add to smoothies. It’s creamy texture blends perfectly and it’s mild flavour works with pretty much anything. Avocado goes well with all kinds of flavours such citrus, chocolate and berries but unless you’re adding a lot you can’t really taste it either way. You can use fresh or frozen avocado in smoothies. I usually have both fresh and frozen avocado on hand but for this creamy chocolate drink, I went with fresh for a beautiful creaminess you will love. 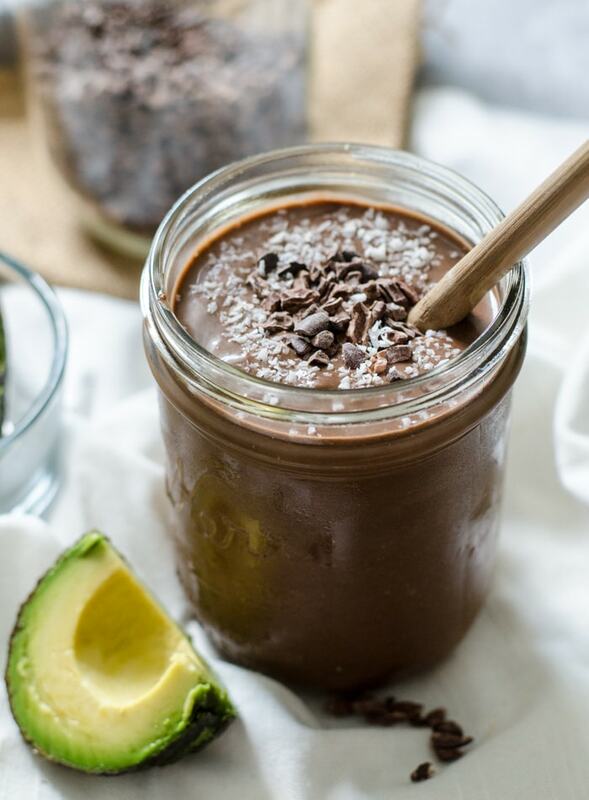 You can also try avocado in this low-sugar chocolate avocado smoothie. What Makes this a Superfood Smoothie? To create this superfood avocado smoothie, I loaded it up with some of my favourite power ingredients. Some of these additions are your everyday healthy ingredients and some, like cacao and maca, are a little more fancy. If you don’t have access to them, I’ve provided some substitutions below. 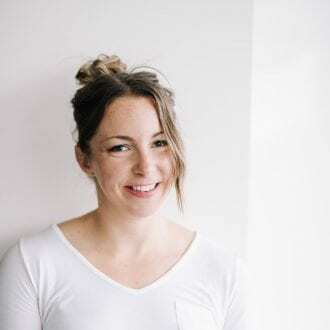 If you don’t keep maca on hand, you can leave it out or substitute it with another superfood powder such as reishi, chaga, lucuma or camu camu. Almond butter can be substituted with any other nut or seed butter. Though highly recommend for the amazing crunch they add, the cacao nibs can be left out, or substituted with dairy-free chocolate chips or carob chips. You can add them in with the rest of the ingredients or pulse them in once the smoothie is blended for a chocolate chip avocado smoothie. Cacao powder can be substituted with cocoa powder, this will provide the chocolate flavour but you’ll lose the superfood benefits of cacao. The Vega protein powder and be substituted with any vegan protein powder. I used 30 grams in the recipe. If you add the sea salt, please use a good quality unrefined sea salt and do not use table salt. For more superfood smoothie ideas, check pout my post on the best superfoods to add to smoothies. Cauliflower in Smoothies: To Steam or Not to Steam? I used to just use raw cauliflower in smoothies but since I started paying more attention to how I was feeling after eating certain foods and realized that it might have been the culprit of some bloating and digestive issues, I’ve switched to lightly steaming it before freezing. I think it depends on the amount too though, I only used 1/2 cup of cauliflower pieces in this smoothie so I could probably tolerate it without steaming. You know your body best. If you can tolerate raw cauliflower go for it, but most of our digestive systems could probably benefit from lightly steaming it first. This amazing chocolate banana smoothie is incredibly creamy and has just the right consistency and rich, decadent and delicious taste. If you’re not a big avocado fan, don’t worry, you can’t taste it in the smoothie so its’a good way to enjoy the many benefits of avocado, even if you’re not an eat-an-avcoaado-with-a-spoon kinda person. You can’t taste the cauliflower either so it’s a good way to sneak some of this fibre-rich veggie into your diet. This smoothie is anti-inflammatory, high in magnesium, full of antioxidants, high in fibre and contains many other vitamins and minerals. You can enjoy it for breakfast or a snack anytime of day or as a post-workout recovery drink. I know the ingredient list seems a little long but some of it’s optional and you should most of in your fridge or pantry already. For fruit and veggies, you’ll need cauliflower, avocado and frozen banana. I also added dates but they could be left out if you don’t have any or want to reduce the sugar content. I added plant-based protein for extra protein and sweetness. I recommend adding 1/4 to 1/2 teaspoon of unrefined sea salt as it really enhances the flavour of the smoothie. 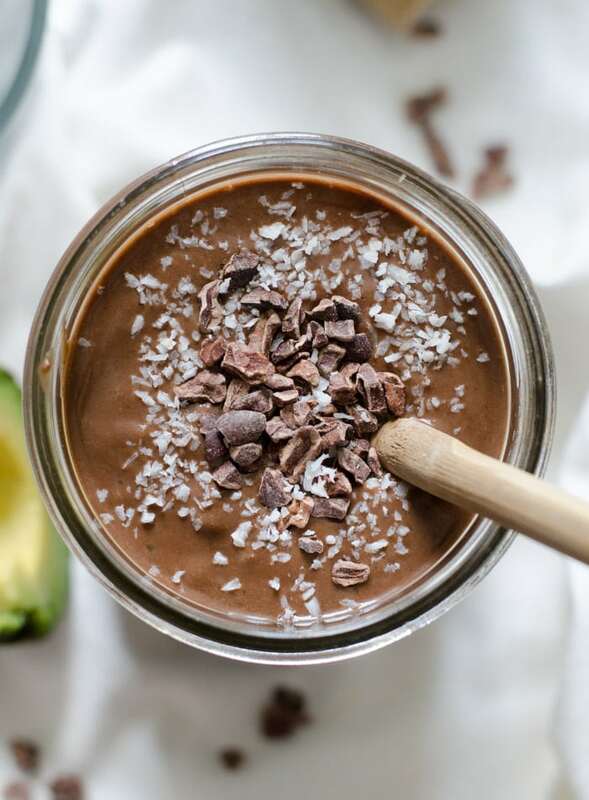 This decadent and creamy chocolate avocado banana smoothie contains a list of superfood ingredients that will leave you buzzing with energy. It’s high in fibre, nutritionally-balanced, packed with antioxidants, vitamins and minerals and tastes amazingly rich and decadent. It has quite a few ingredients but they’re all fairly common, are probably already in your pantry and they all do their part in taking this superfood smoothie to the next level. Add all ingredients to a high-speed blender and blend until smooth and creamy. If you want you want to try a chocolate chip avocado smoothie, leave the cacao nibs out until the end and then pulse a few times to combine, or you can just stir them in. To reduce the sugar in this smoothie, omit the dates and use less banana and more cauliflower. See notes in post for substitutions. Wow this looks absolutely amazing!!!! Thank you for sharing, I might do this over the weekend. ???? 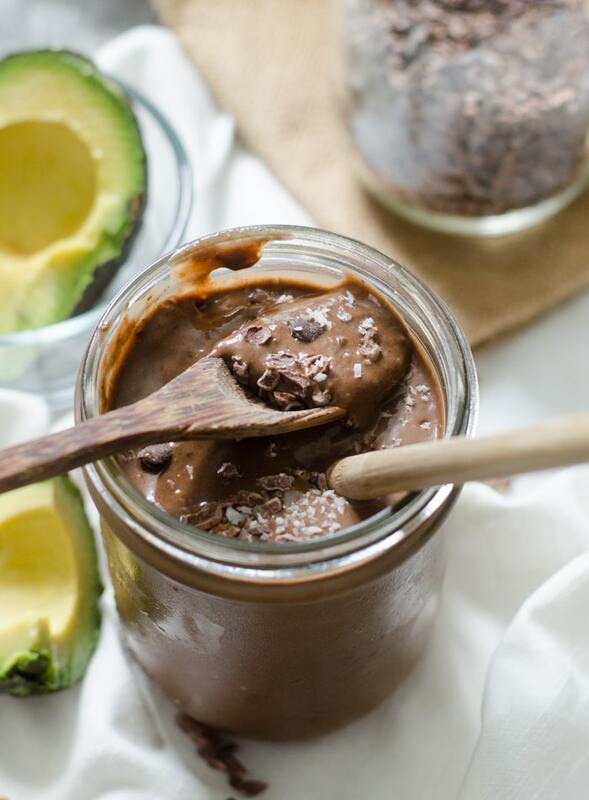 I never really thought of Avocado and Chocolate together. Good Stuff !! This looks so good but I have NO IDEA where to get half of the ingredients!! Lol!! I’ve given links if you’re interested in purchasing on Amazon, otherwise please see my suggestions for substitutions in the post. You can leave out the maca, sub cacao and cacao nibs, use any protein powder, and use regular cinnamon. Hope that helps! 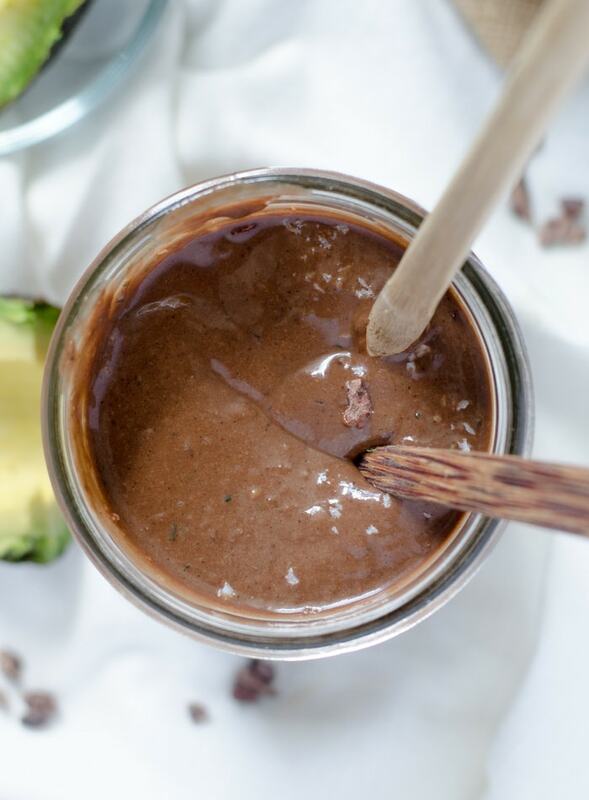 I love to use avocado in my sweet treats, I used to make some delicious chocolate cookies with avocado but I never heard of cauliflower in smoothies, I need to try it! It honestly looks delicious! 😉 Would you mind check out my page? Maybe we can follow each other ???? I love avocado in sweets! It’s so good in baking like you said. I’ll check out your site. Thanks! I always love your ideas for nutritious treats! I will have to try adding the avocado and cauliflower. The steaming part intrigues me. Do you steam broccoli before adding to a smoothie too? I’ve added frozen broccoli and I wonder if that is the reason behind the bloating?? Thanks for the tips! I’ve never added broccoli to a smoothie so I can’t say! I usually lean towards lightly steamed broccoli these days so I probably would cook it a bit if I was going to add it to a smoothie. I could definitely be a culprit of bloating, it just depends on your digestive system. I’ve really been paying more attention to how I feel after eating certain foods and it’s really helped me improve digestion. You could try it raw and try it steamed and see if you notice a difference! This sounds so yummy! I use Vega protein powder in my smoothies and love it. I didn’t know they had performance powder, but I may have to get that for my hubby. This sounds and looks os delish! Love seeing new rcipes! Vegan me is loving this recipe! Gonna give it a try for my little boy. woow, Interesting … Loved the combination… Thanks for sharing.. !! Very Nice recipe. and yummy too. I just loved it. Thanks for sharing this information. This avocado smoothie bowl is mixed with cashew cream and topped with pomegranate and coconut. It s an easy, healthy, superfood-filled breakfast or snack! Is the Vega Performance Protein necessary? Is there a substitute?